When it comes to search engine optimisation, building backlinks is considered as one of the most important undertakings behind a successful campaign. Link building doesn’t mean that you should create links at any cost – literally and metaphorically. From experience link building activities can be a very expensive process both in terms of time and money. 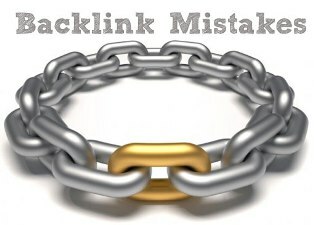 There are many mistakes that webmasters make when it comes to link building. In this article we discuss the ten most common mistakes. The ‘nofollow’ attribute on a backlink tells search engines not to pass any ‘link juice’ back to your website which is the whole purpose of the link building exercise. Google places a lot of weight on having both ‘dofollow’ links and ‘nofollow’ links so it’s important that you try to acquire both. The point of this is that you should place more focus on acquiring ‘dofollow’ links that may pass ranking benefits. Anchor text is one of the most important factors to consider when building inbound links. The anchor text tells Google what the page is about that the link is pointing to, so you need to gather links with different anchor text. So remember, it’s important not to build too many links with the same anchor text as this could be flagged as spam. Many inexperienced webmasters are attracted to building links in which you have to click and image to go to the website. Whilst these types of links do draw attention, they have no SEO benefits as Google doesn’t have any anchor text to read. If possible, you should try to avoid these types of links if you can have a text link. Whilst we did say to avoid image links, sometimes it isn’t possible and image link is better than no links at all. If you do end up having to create an image link then it’s important to try and include your keywords with the ALT tag; after all some keywords are better than none. This could easily be considered one of the biggest mistakes when it comes to link building. Some people go to excess to build links from anywhere they can find, this doesn’t work! When link building, you should try to build links from relevant websites. If you own a dating website then getting links from finance websites will not help your rankings. Relevant links are key to good SEO! Having your links on a page that has hundreds of links to other websites is a bad idea as Google considers these pages to be of low quality and ‘spam’. When looking for quality links, try to find pages that link to good websites not hundreds of poor websites. This one has become more common over time as websites try to link out to as few pages as possible. There are various types of pages that spiders can’t crawl; these can include dynamic pages and pages that have been blocked by the robot.txt file. Whilst your link may seem fine, it has no value as the search engine spiders can’t see the page and therefore can’t follow the link back to your website. Paid links might work at first but eventually they will come back to hurt your rankings. New webmasters almost always buy links with the thought of easy rankings in mind, the problem is, Google is very good at finding paid links and when they do they remove any value they once had and could possible penalise your site. When you link to other websites, Google sees this as your website ‘endorsing’ that website. The problem is, if you link to a bad website, Google could consider this as you trying to help promote a bad website and could possible penalise your website. Before linking to any other websites you should consider the credibility of that website. Sometimes you can link to websites that were previously credible and they could begin to start linking to other questionable websites or even post dubious content themselves, again this is bad for you. You should always try to keep an eye on which websites you link to and try to visit them as frequently as possible. Anything to add or to discuss about? Please let me have your comment! I’ve gone inter-linking nuts Erik but most are to different posts, and I usually switch up the anchor text. Good tips! Thanks for adding your thoughts and experience, Ryan! Thanks for the helpful tips. I didn’t realize that the anchor tags were so important. What are a list of social media sites with dofollow? I read that twitter and facebook links are nofollow. Is this true? Points are good,each point supported with example would have added more meaning and relevance. any ways on point number 2 – anchor text, a mistake that many people are doing is putting anchor text on key word, which should be avoided. Thanks for adding your suggestions and views, Harish! Thanks for sharing this useful post with us.Link building can be essential and inconvenient also if it is not handled properly.Above points are really beneficial and the video too.Keep sharing for future also. Both Nofollow and dofollow are best techniques in SEO. I read somewhere that Nofollow links from authority sites are good for SEO. As you said in point 2, that don’t build same anchor text as it considered spam link building but I saw most of blogger spend their time to read other blog post and do comment there to get backlinks but they put same name in every blog. then anchor text will be same in most places. For exaple I do comment on blog and I put my name Areesha Noor. this will be my anchor text. then most of backlinks that I created from different blog commenting is the same. It’s mean this will be spam. What you will say about it? Both nofollow and dofollow links are needed, to get a natural profile. I would doubt seriously if using a person’s name as an anchor text would ever become a problematic link construction. The simple reason is that every blog comment has a name associated that links back to your site. Blog commenting is a great way to get traffic and to build your name around blogosphere. Very instresting information back linking is good way to improve rank but how to get traffic from google is there any way? or backlink will send traffic from search engine ? I do agree with some of the points you are making here.. I also think this is a great thing to talk about, considering that know what to do is only half of the battle; you also need to know what to avoid when link building. However, I also have to disagree on a few mistakes. Natural Anchor Text: It should look like the links were build by users, not for SEO sake. Don’t use the same anchor text in all your links; vary it by throwing in a useless word here and there and yes, do a few “click here” anchors as well. Links from Varied PR Pages: Don’t make it a point to get all your links for PR 5+ pages. As you can imagine, that kind of SEO link building looks unnatural. Also, your links Should Not Be Temporary. If you employ a link building company or use subscription software and pay a monthly fee for SEO link building services, then your links are only good for as long you are paying for them. As soon as you stop, your links will disappear. It’s been speculated that this can even be a factor of the Google Sandbox filter. My personal opinion: save your money. There are plenty of ways to get permanent links that are absolutely free – i.e. done by you. What do you think about my suggestions? When it comes to Link building, I always fall behind, don’t know why, but I have never succeeded, when it tried building links manually, although, I am good at writing content and sometimes, I get natural links, but not much, those links are not enough. So, I tried things like Guest Posting, but never has any benefit from it. Now, I am very much confused, whether to build links to not. What Should I do now? Should I build Links or avoid?